At a Foot Clan council meeting, Karai informs the Shredder of their increase in profits since the Foot consolidated all criminal activity in New York. 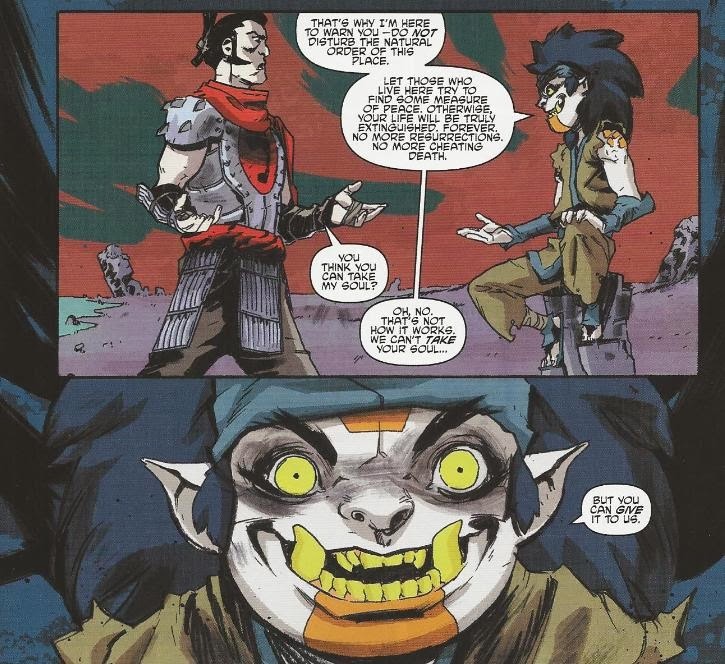 Karai reports some losses in soldiers, but dismisses their sacrifice, as everyone has to die eventually. Jokingly, she looks to Shredder and says “almost everyone”. Disarmed by the comment, Shredder ends the meeting abruptly and leaves. Kitsune comes to him and says that whenever his resurrection is mentioned, he becomes insecure. She says it is a weakness that could be exploited unless he openly discusses his death and resurrection with her. Oroku Saki concedes and takes a seat with Kitsune, who inquires where his soul went when his body died. The past. Saki finds himself in the afterlife where all souls must eventually go. He is welcomed by a demon child who warns him not to disturb the natural order of the land, lest he surrender his soul for all eternity. The demon child mocks Saki, telling him that he cannot cheat death forever and that, in the end, he WILL lose his soul. Brushing off the child’s words, Saki roams the wasteland and finds only the shambling spirits of vanquished warriors who do not appear to have any motivation and barely any thought faculties ("reflections of their former selves"). He leaves them be and heads toward a great castle dominating the skyline. Saki finds the castle guarded by demons and decides that if he must bide his time in the afterlife until his resurrection, he’d prefer to do it as the absolute ruler. Saki attempts to rally the warrior spirits to lay siege to the castle, but his scheme backfires. The mindless spirits want only to fight and Saki has now made himself a target. He battles the hordes and calculates the weakness of every combatant, defeating them one-by-one. However, they begin to overwhelm him with sheer numbers and after falling off a cliff, Saki finds that he is losing control of the situation. Realizing that these warrior spirits are doomed to follow their basic instincts, he deduces that they crave leadership as much as they crave battle. Taking a dominating stance, he commands the souls to stand down. The warrior spirits pause and Saki tells them that if they crave battle then they can slake their thirsts on the armies guarding the castle. He leads the warrior spirits to the castle and they do battle with the demon guards. With the guards distracted, Saki infiltrates the palace and makes his way to the throne room. He finds an elderly king in samurai armor sitting atop a throne. He challenges the king, who rises to the occasion and attacks. Saki is unimpressed by the old man and fatally stabs him. Saki casts the corpse of the king to the ground and claims victory. The demon child then appears before Saki and thanks him for surrendering his soul. The demon child then removes the helmet of the old king, revealing Saki’s own countenance, withered with age. Saki is confused and the demon child explains. Yes, he will cheat death again and he will return to Earth and he will command armies. He will rule the world and populate it with mutants and monsters. Eventually, though, he WILL succumb to death, permanently, and when he returns to the afterlife he will take back his throne. But time in the afterlife is not linear and eventually he will be encountered by his younger self, who will kill him in a battle… THIS battle. And in doing so, Saki’s soul will be lost and he will spend eternity restlessly wandering like the other warrior spirits. The present. Saki concludes his story to Kitsune. She suggests that it was all merely a dream, though the lesson is perhaps one he should meditate over. Saki agrees and dismisses her. What he didn’t tell Kitsune is that he has been troubled by this vision every night since his resurrection and has found the spirit of his older self haunting his every move. 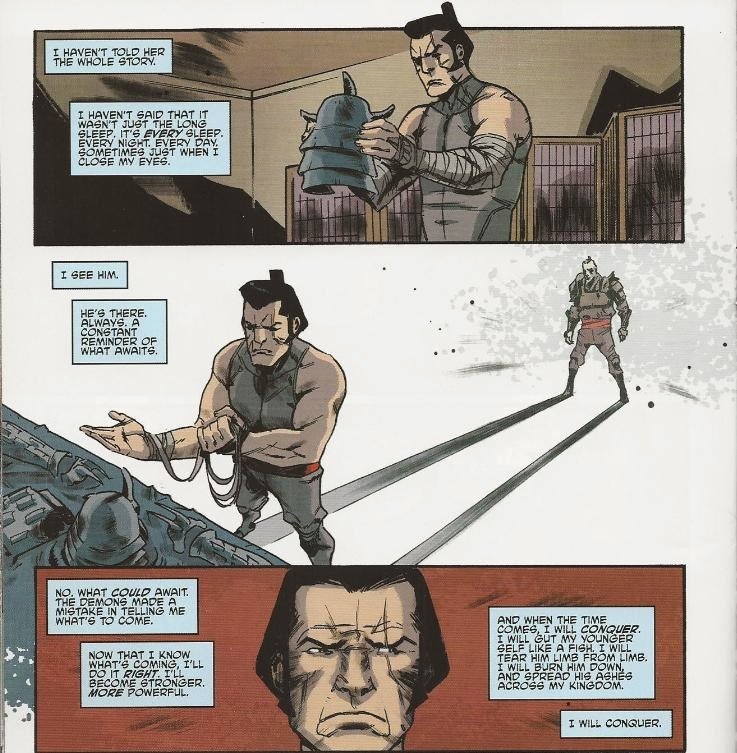 Saki concludes that his fate is not set in stone and that he CAN alter the outcome of his final battle. Staring out over the city, he confidently declares that when the time comes, he will slay his younger self and rule over eternity. *This issue takes place after TMNT (IDW) #28. *The Shredder's death and resurrection were seen in TMNT: Secret History of the Foot Clan #4. *General Krang can be seen in the vision of the future the demon child projects, doing battle with Shredder and the Foot Clan. This will come to pass in TMNT (IDW) #43. *The Turtles will visit the future where Shredder populates the Earth with mutants in TMNT: Turtles in Time #4. *This issue was originally published with 3 variant covers: Regular Cover by Tyler Walpole, Cover RI by Duncan, and Subscription Cover (blank). With this epilogue, “City Fall” at last concludes. A massive 14-part affair, I’ve already said my piece about the storyline in my review for issue #28, so I won’t repeat myself. This story, incidentally, hasn’t much to do with the actual “City Fall” arc and instead feels more like an overdue epilogue to the Secret History of the Foot Clan miniseries (much like TMNT Villains Micro-Series #5: Karai did). 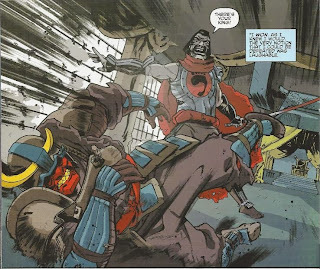 I’ll admit that “where Shredder’s soul went while he was awaiting resurrection” wasn’t a question at the top of my list to be answered, but Duncan and Allor spin a pretty good yarn from it, regardless. In all the science fiction stuff that’s been going on in the main IDW book lately, from aliens to mutants, it might be easy to forget that there’s a strong supernatural undercurrent to this TMNT universe. With the Turtles being reincarnations of deceased children and all the various resurrections going on, IDW’s TMNT are pretty well built on a foundation of spirituality. So even though it’s a question I never thought to ask, that doesn’t mean it isn’t a question worth addressing. If you’re going to have ghosts and zombies and demons in your universe, then you ought to explain where they come from and where they go, I suppose. Though perhaps a tad telegraphed by the samurai armor, the identity of the king and the cyclical nature of the story presented a decent twist. The lesson isn’t that the future is written in stone (the demon child says that Saki rules the world and destroys civilization and I’m doubtful that’s going to happen), but rather that Saki is playing into the demon’s hands and dooming himself by making the wrong changes. There are any number of ways he could wriggle out of that final battle in the castle, but buckling down and determining to slay his younger self probably isn’t the way to go (to say nothing of the time paradoxes that would result in, should he succeed). Whether the IDW narrative ever returns to that proposed endgame is something only time will tell. Now, there were some troubles with the story that kept me somewhat distracted as I read. Firstly, why is Kitsune asking Saki what being dead was like and where the spirit goes? She underwent the exact same resurrection routine that he did; she should be as experienced in this field as he is. I suppose there are any number of ways to circumvent that critique. Kitsune was trying to get Shredder to discuss what’s been bothering him, so maybe she was playing ignorant of the afterlife to elicit a therapy session. Or, since she suggests it was all a dream, maybe it actually WAS all a dream and your soul doesn’t go anywhere when you die. OR, since Shredder says that he didn’t immediately have these memories when he was resurrected, and Kitsune hasn’t been back on her feet as long as he has, her own memories of the afterlife just haven’t returned yet. But all No-Prizes aside, I think the issue could have been mooted with a slight rephrasing of the dialogue. Rather than claiming ignorance of where the soul goes upon death, she could simply be ignorant of what particular circumstances Saki found himself in after he died. My second criticism, and the one I found more distracting, was the idea that the dead can die. Saki was already dead and in the afterlife, so what does it matter if the warrior spirits stabbed him and beat him up and threw him off a cliff? Yes, he addresses that he can feel pain… but he’s already dead. That really dulls the suspense of the various fight sequences in this issue as there just isn’t a whole lot for dead people to worry about when they get injured. I think the demon child tried to explain it at the end, that when you “die” in the afterlife, you lose your faculties and become a mindless wanderer for all eternity like the warrior spirits outside the castle (a “reflection of your former self”, as Shredder worded it). The consequences were a bit confused and still relied on the visuals of “dying” when you’re already dead, which is a concept I just couldn’t buy. Your mileage may vary, though. It was nice to see Dan Duncan back for a full issue. He really shaped the early issues of the IDW series so he’s always a pleasure to see again. His style is naturally very dark with a lot of messy ink work to it, so he struck a good tone for the setting of this particular issue. All in all, as a Micro, I’m not sure how much we learned about the Shredder’s character. He’s driven to rule and has no lack of ambition (he makes ruling planets sound like small potatoes when his ultimate goal is to rule the afterlife). The inner monologue as he carefully disarms and dispatches each enemy illustrates how crafty and experienced he is in a fight (I wish he’d actually DISPLAY some of that ability in his skirmishes with the Turtles, who keep getting the better of him). But in the end, his undoing seems to be something as simple as his ego; the very ambition that drives him to rule all inadvertently dooms him in eternity, as he refuses to walk a humbler path. I dunno if all of that was necessarily news to me, but it was certainly a solid deconstruction of his character. The death in the afterlife thing really reminded me of Dark Souls. While the game does not take place in the afterlife,the player, and any other character in the world, is in danger of going the hollow. They would lose their humanity, having no goals, no thoughts, no free will. I'm hoping this afterlife is explored more thoroughly in the future but it seems like cooldown with the turtles (Hopefully getting to know them quite a bit more) and the Science fiction in Utrom Empire are going to be the main focus for a while. I'll miss the micro issues and I certainly hope they do them again. I love the clean mini stories they present over the long wait for an arc. "By this comic’s own rules of death in the afterlife, do you just get a little stupider every time you die?" I was thinking same thing. We're gonna need a Micro-Series issue dedicated just to the poor Warrior Spirits, I think. It could be similar to DBZ's rules... where you kinda live a life in the afterlife after you die.. but if you die while dead, you cease to exist altogether. 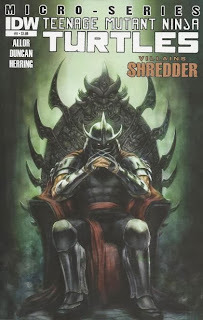 From what I understood the Shredder is not really dead in this issue, he has his soul because he is just passing by before he is resurrected and since time does not travel a straight line in this hell they don't take his soul (or his will or whatever) yet because they know he'll live again, but everyone else (including his future self) have lost their will at this moment, his older version (as arrogant as he's always been) never said a word while he fought his younger self and I found that very strange so probably the only person alive in there was the young Oroku Saki, all the other were merely shadows of their existence, so the only one that had to worry about dying or loosing his soul was Saki. Ironically, these reviews bashed IDW for giving away events.....then do it too.